The American Idol-style audition process for those who want to take part in the proposed MarsOne project to build a human outpost on Mars will provide a great laboratory for the study of human systems. To Dr. Raye Kass, an adviser to the project and a Concordia University professor of applied human sciences who wrote about it for The Gazette last week (“Going to Mars starts with the right attitude,” May 17), the process must be irresistibly interesting. In my view, however, the MarsOne project is a disingenuous and unethical adventure in human manipulation and hype. The only vision it represents is an updated version of the greedy foresight of 19th-century industrialists and 21st-century media barons. Dr. Kass’s analogy of the MarsOne project with the travels of Ferdinand Magellan and Ernest Shackleton is compelling, but it breaks down quickly. It is safe to say that although no one is known to have circumnavigated the globe or travelled to Antarctica before the time of Magellan and Shackleton respectively, the technology to accomplish these projects was well established. In Magellan’s case, people had been sailing those waters for at least 1,000 years before he left Spain. Anyone who signed on to those adventures would have understood the existing technology well enough to make a reasoned assessment of the risk. Those who set sail with those men would also have understood that although they might not come home, they would have a reasonable probability of living the rest of their lives (should they survive the trip) somewhere else where human habitation was established in some way. Neither of these is true with the MarsOne project. MarsOne commits to using “existing technology.” What existing technology? Canadian astronaut Julie Payette has said that the technology is not anywhere near established to get people to Mars, land them safely, support the payload necessary to sustain life, allow humans to move about on the planet, and so on. No opportunity to “kick the tires” appears to be in the plans of this project — until, that is, the applicants have been so inculcated in the fantasy, so completely examined for suitability and so publicly displayed as potential heroes, that withdrawal would be extremely difficult. Finalists will be emotionally attached, not to mention manipulated and pressured, long before they have a chance to objectively evaluate the vehicles, equipment, systems and protocols that will protect and sustain them. If we are going to use early explorers as an analogy, we should do so honestly. Very, very few of the participants in early explorations went for the good of humankind. Many were so desperate to leave their wretched lives that even a ship setting sail for the unknown was better than their current existence. Many were criminals; many were ordered on the voyage; and some were actually kidnapped. Magellan’s was a voyage of colonization, greed and military intervention. The outcomes of many of these explorers’ travels, once you remove the myths, were genocide, tyranny and environmental degradation. If history is to be our guide to the best-case scenario for MarsOne, it’s a good thing there aren’t any sentient beings on the red planet, because they would probably be killed or enslaved and whatever riches they might possess would be stripped from them and shipped back to Earth for the pleasure and profit of a fortunate few. MarsOne will sell and license merchandise — and, notably, media rights. Given the potentially riveting human drama of people competing for spots — like an interplanetary version of Survivor — and the high ratings the minute-by-minute account of a potential space disaster might reap (remember Apollo 13? 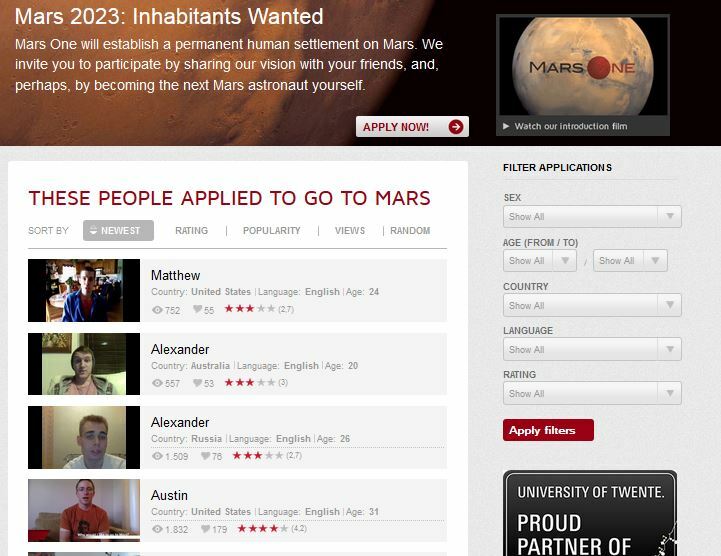 ), MarsOne could be the most successful and profitable reality-TV show of all time. And we all know how honest and ethical those shows can be toward participants and viewers. – By David Gobby. Dr. Kass states that “when the human spirit stops exploring, something has been lost.” I submit that MarsOne is demonstrably not that kind of exploration. David Gobby is an administrator at Concordia University’s School of Extended Learning and has an MA in human-systems intervention from Concordia. He lives in Greenfield Park. This article was originally published in the Montreal Gazette. It is reposted with permission of the author and editor. Opinions expressed are those of the author and may not reflect the views of Space Safety Magazine, the International Association for the Advancement of Space Safety, or the International Space Safety Foundation. Amen to everything Mr. Gobby wrote. But he should be reassured that MarsOne will never make it close to launching anything to anywhere near Mars. Its exploitation of potential colonists will be limited to the 21st century Earth-based variety. Sad enough, but no interplanetary horrors need be invoked.